Mudakathan keerai (முடக்கத்தான் கீரை) or balloon vine is a medicinal herb, used in native medicine to treat joint pain. Balloon vine has a gentle bitter taste, which gets masked by cooking. Traditionally, dosa, rasam and chutney are made with this herb. However, I prefer to make rotis with mudakathan keerai and it turns out well. Please give it a try. Method: Separate mudakathan leaves from the stalks, chop finely, wash in running water twice and drain fully. Add required salt to the leaves, mix well and keep aside for 10-15 minutes. Chop onion and green chili finely. 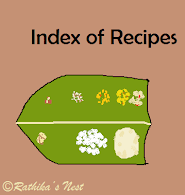 Mix onion, green chili, salt and mudakathan leaves with wheat flour in a bowl. Add water little by little to make firm dough. Add gingelly oil and knead very well. Set aside for 20 minutes. Later, divide the dough into 6 equal parts and shape them into balls. Roll out the dough balls into circles of 6-7” diameter on a board dusting with flour as required. Heat tava on medium flame, place a roti on the tava and smear ghee along the edges. Cook till brown spots appear on both sides of the roti, turning it over as needed. Once ready, remove the roti from the tava and cook the remaining rotis in the same manner. Serve hot with any curry or sabzi of your choice.